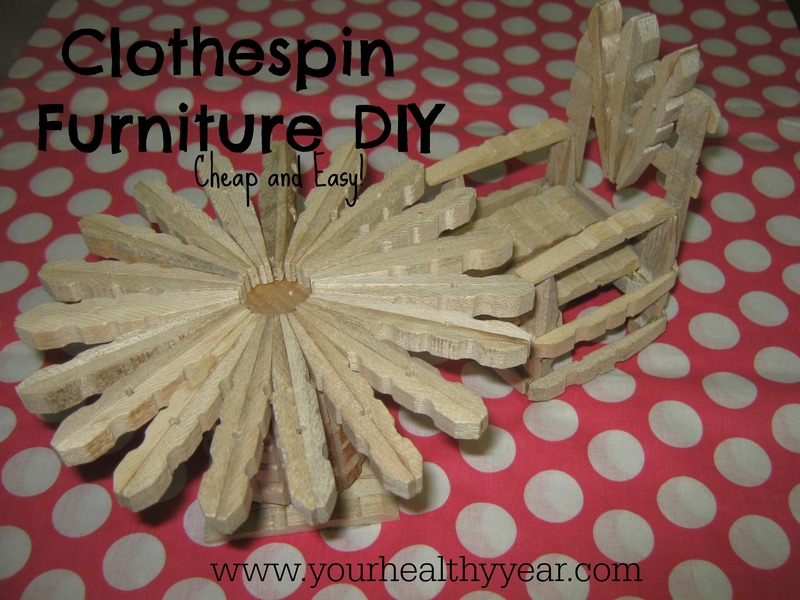 clothespin crafts -DIY furniture that is cute, cheap, and easy! 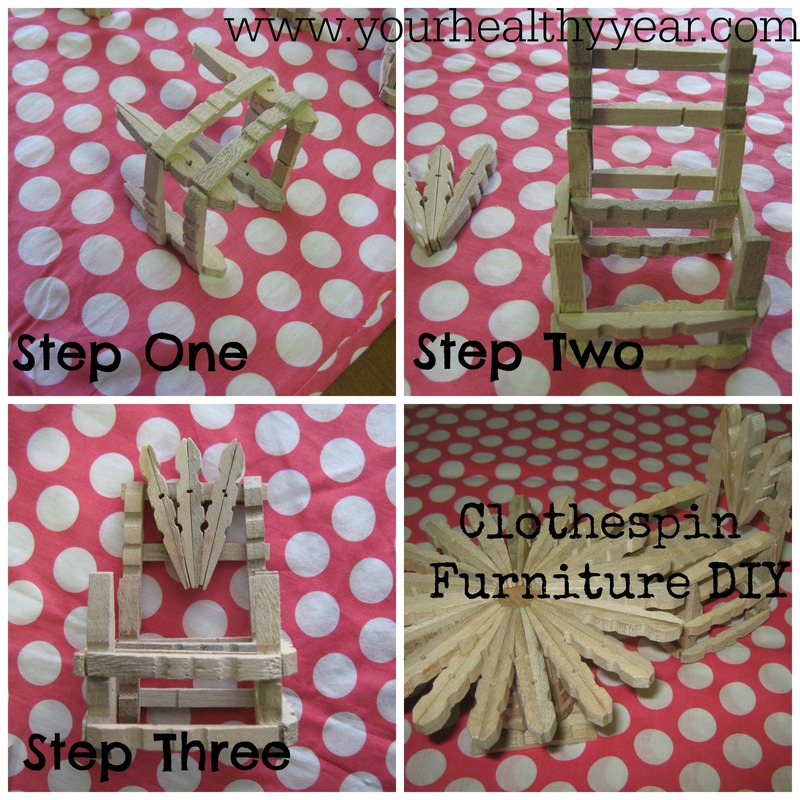 Clothespin Crafts – Easy and Cheap Furniture! My mom has been making these cute clothespin furniture pieces for as long as I can remember. They make cute decorations, and were fun for our dolls! The cost to make them is under $5 and they are really easy for little hands too! 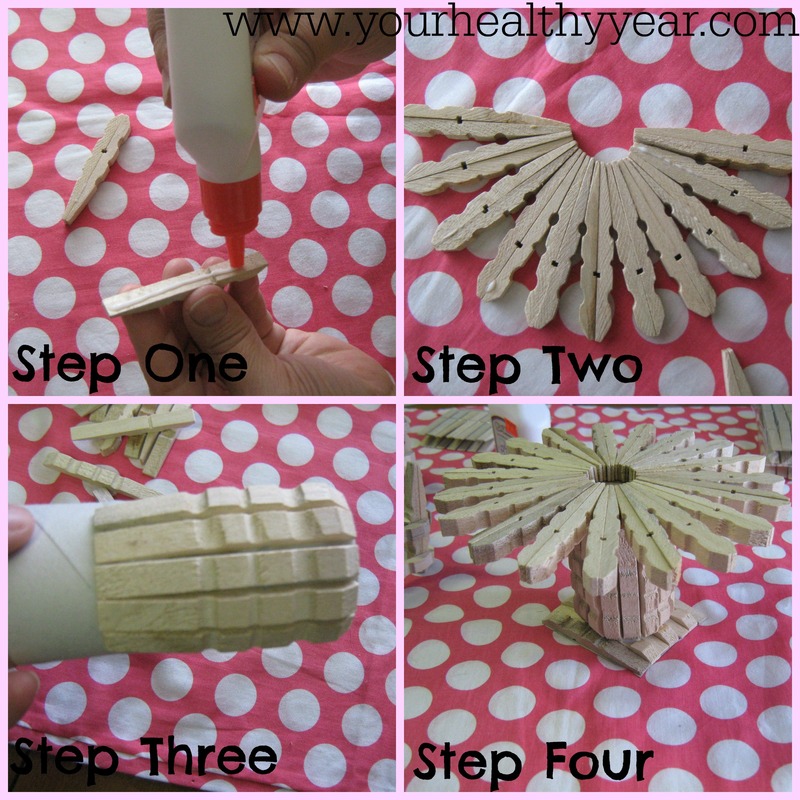 All you will need for these clothespin crafts are clothespins, white glue, a toilet paper roll, and a flat piece of cardboard. The first thing you are going to want to do is separate your clothespins by taking out the metal piece that holds them together. Then glue the two flat sides together, as shown in “Step One” picture above. Glue enough of them together until you form a circle as shown in step two. Glue all clothespins in place to secure the circle, this will be the top of the table. Next, use a toilet paper roll and glue the flat sides of the clothespins to it, as shown in step Three, glue them all the way around, let dry, and then cut off the extra roll where the clothespins end. This is not shown, but to make the base of the table you will need a flat piece of card board. Glue the flat sides of the clothespins to the cardboard, about 5 or 6 of them. You can see the finished table with the base in Step Four. For the chairs you will first need to glue clothespins together, like in step one for the table. You will need 4 of these to make the 4 ‘legs’ of the chairs. Then glue more clothespin halve with flat sides against the ‘legs’ for support. Glue more clothepin halves on ONE side of the chair base to create a chair back, you can see that in Step Two. Step Three, take six more clothespins and glue the flat part together to use as chair decoration. Finally glue the ‘seat’ of your chair on and add arms to your chair. These are very simple to make and can be painted anyway you like. My mom likes to put little doilies on the table for a decorative tablecloth. Previous Article← First 5k Tips – What I wished I had known. Doll furniture is so pricy! A circle of plexi glass would make that an extra fancy table! These are so cute! I would have loved these when I was a kid. Adorable! Now I need a grand child! The doilies as a tablecloth is a great idea. Thanks for sharing this craft with us! And thank you for partying at Inspire Me Mondays! Enjoy your weekend and we hope to see you back at the Link-Up! I love this idea, brilliant! And it’s super easy to make..so love clothespin! 🙂 thanks for sharing!